PASADENA, Calif. -- NASA's Nuclear Spectroscopic Telescope Array, or NuSTAR, has successfully deployed its lengthy mast, giving it the ability to see the highest energy X-rays in our universe. The mission is one step closer to beginning its hunt for black holes hiding in our Milky Way and other galaxies. "It's a real pleasure to know that the mast, an accomplished feat of engineering, is now in its final position," said Yunjin Kim, the NuSTAR project manager at NASA's Jet Propulsion Laboratory, Pasadena, Calif. Kim was also the project manager for the Shuttle Radar Topography Mission, which flew a similar mast on the Space Shuttle Endeavor in 2000 and made topographic maps of Earth. NuSTAR's mast is one of several innovations allowing the telescope to take crisp images of high-energy X-rays for the first time. It separates the telescope mirrors from the detectors, providing the distance needed to focus the X-rays. Built by ATK Aerospace Systems in Goleta, Calif., this is the first deployable mast ever used on a space telescope. On June 21 at 10:43 a.m. PDT (1:43 p.m. EDT), nine days after launch, engineers at NuSTAR's mission control at UC Berkeley in California sent a signal to the spacecraft to start extending the 33-foot (10-meter) mast, a stable, rigid structure consisting of 56 cube-shaped units. Driven by a motor, the mast steadily inched out of a canister as each cube was assembled one by one. The process took about 26 minutes. Engineers and astronomers cheered seconds after they received word from the spacecraft that the mast was fully deployed and secure. The NuSTAR team will now begin to verify the pointing and motion capabilities of the satellite, and fine-tune the alignment of the mast. In about five days, the team will instruct NuSTAR to take its "first light" pictures, which are used to calibrate the telescope. Why did NuSTAR need such a long, arm-like structure? The answer has to do with the fact that X-rays behave differently than the visible light we see with our eyes. Sunlight easily reflects off surfaces, giving us the ability to see the world around us in color. X-rays, on the other hand, are not readily reflected: they either travel right through surfaces, as is the case with skin during medical X-rays, or they tend to be absorbed, by substances like your bone, for example. To focus X-rays onto the detectors at the back of a telescope, the light must hit mirrors at nearly parallel angles; if they were to hit head-on, they would be absorbed instead of reflected. On NuSTAR, this is accomplished with two barrels of nested mirrors, each containing 133 shells, which reflect the X-rays to the back of the telescope. Because the reflecting angle is so shallow, the distance between the mirrors and the detectors is long. This is called the focal length, and it is maintained by NuSTAR's mast. The fully extended mast is too large to launch in the lower-cost rockets required for relatively inexpensive Small Explorer class missions like NuSTAR. Instead NuSTAR launched on its Orbital Science Corporation's Pegasus rocket tucked inside a small canister. This rocket isn't as expensive as its bigger cousins because it launches from the air, with the help of a carrier plane, the L-1011 "Stargazer," also from Orbital. 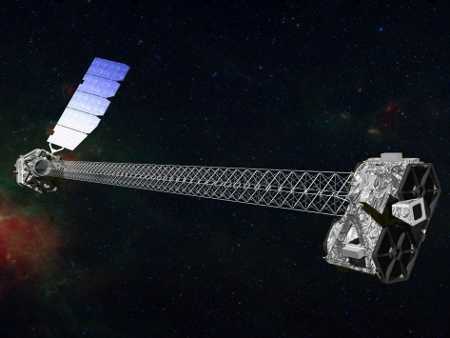 NuSTAR is a Small Explorer mission led by the California Institute of Technology in Pasadena and managed by JPL for NASA's Science Mission Directorate in Washington. The spacecraft was built by Orbital Sciences Corporation, Dulles, Va. Its instrument was built by a consortium including Caltech; JPL; the University of California, Berkeley; Columbia University, New York; NASA's Goddard Space Flight Center, Greenbelt, Md. ; the Danish Technical University in Denmark; Lawrence Livermore National Laboratory, Livermore, Calif.; and ATK Aerospace Systems, Goleta, Calif. NuSTAR will be operated by UC Berkeley, with the Italian Space Agency providing its equatorial ground station located at Malindi, Kenya. The mission's outreach program is based at Sonoma State University, Rohnert Park, Calif. NASA's Explorer Program is managed by Goddard. JPL is managed by Caltech for NASA.